BalkanViator is a new website that aims to make life easier for anyone travelling by public transport in the Balkans. As many travellers in the region are aware, details of bus routes in the region can be frustratingly difficult to pin down when planning a trip. Websites with bus timetables are often fragmentary and provide limited information (for example departure times but no arrival times, or routes listed by final destination with no indication of intermediate stops). The idea behind BalkanViator is to put an end to all this by making available in a single website the information about bus routes held by the Ministries of Transport of Serbia, Croatia, Montenegro, Macedonia, Kosovo, and Bosnia - more than 20,000 routes in all. I tried out the database by asking if there are direct buses on August 20th from Dubrovnik to Skopje, Ohrid to Blageovgrad, and Budva to Sarajevo. These are all routes people have asked me about in the past, and for which I have had trouble tracking down a definite answer. The answer turned out to be "yes" in all three cases. BalkanViator provided full timetables including intermediate stops, and the names of the bus companies operating the routes. As well as the bus timetables the site has a carpooling section, and details of taxi companies in many Balkan cities. The site is available in six regional languages as well as English. BalkanViator has the potential to be a very useful resource for travellers in Southeast Europe and I wish the team the best of luck with the website. Both Seat 61 and Europe by Rail report that it is no longer possible to travel by train from Tirana/Durres through central Albania to Pogradec on the shores of Lake Ohrid. This probably won't disrupt the travel plans of many travellers, few of whom were ever prepared to submit themselves to the rigours of the famously slow 6-to-7 hour trip. But the distinctive character of the journey did appeal to some visitors, and I had hoped to travel the route some day myself. I have not seen any indication of what prompted the closure or whether there is any hope of a resumption of services in future. There is still one service daily on this line, from Tirana via Durres and Elbasan as far as Librazhd, a town I have to confess I had never previously heard of. It takes around five hours from Tirana to Librazhd, four hours of which are accounted for by the meandering route between Tirana and the the substantial town of Elbasan, a trip which can of course be done much more quickly by bus. A couple of weeks ago the rail operators of Romanian and Serbia announced revisions to the main cross-border train service between the two countries. For many years the overnight train from Bucharest to Belgrade was the key rail link between Romania and Serbia. This train called at Timișoara, with a painfully early morning departure time for those joining the train there, as I well remember from my own trip several years ago. There was also a stop at Vršac just over the Serbian side of the border. Apparently the "direct" aspect of this service has recently become a rather notional concept, with replacement buses being used for stretches of the journey. Now the train has been withdrawn from timetables. The good news is that it has been replaced by not one but two cross-border trains daily - a rare example in the time I have been writing this blog of an increase in frequency on a cross-border rail route in Southeast Europe. These will be regional trains between Timișoara and Vršac only. A standard single ticket will cost around 5 euro. Coming from Romania, one service retains the early morning departure from Timișoara, so it is presumably still possible to connect with a night train from Bucharest. This train will be met in Vršac by a bus to Belgrade. Similarly a bus will leave Belgrade in late afternoon to connect with the Vršac-Timișoara train. The second daily train (late afternoon from Timișoara, morning from Vršac) doesn't have a specific bus connection with Belgrade. In any case there is a good bus service between Vršac and Belgrade so travellers shouldn't feel restricted to the connecting bus if they want to spend a little more time in Vršac which is a very pleasant town. More information including timetables is available in the press release from Serbian Railways, and on the excellent Europe by Rail website. When reading timetables don't forget that Romanian time is one hour ahead of Serbian time. UPDATE June 24, 2012: it seems that the construction work referred to below has been deferred until 2013, so services on this route will run normally in 2012 ... probably. 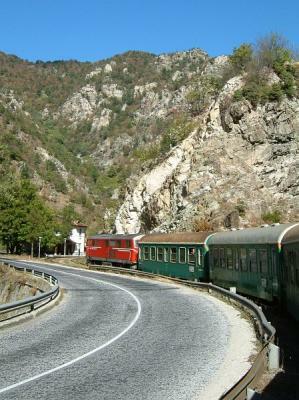 A reader has alerted me to some news about Bulgaria's narrow gauge mountain railway from Septemvri to Bansko and Dobrinishte. It seems that the line will be closed for construction works between June and September 2012, with the trains being replaced by buses for that period. There are more details (in English) at the Hiking Guide Bulgaria website, which also has other useful information such as the summer opening hours of various gondolas and chair lifts in the Bulgarian mountains. In today's Independent Adrian Phillips describes his slightly unconventional honeymoon: a journey by train (mostly) from Hungary to the Croatian coast, calling at Budapest, Belgrade, Sarajevo, Mostar, and Ploče before a final leg by road to Dubrovnik. 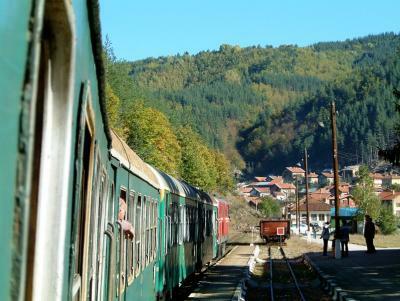 Unluckily, the couple missed out on the scenic trip by rail between Sarajevo and Mostar. The conclusion: "Dubrovnik fits the classic honeymoon mould. But we'd found romance too in the other stage posts on our Balkan journey: not frilly, chocolate-box prettiness but the hardier stuff of Shakespeare, tales of spirit forged in adversity's fire." Bradt Guides have published the 4th edition of their guide to Albania. Written by Gillian Gloyer (who was also the author of the previous editions), the guidebook has expanded to 272 pages. Some of the changes compared to the previous edition reflect the rapid changes in Albania's road network. In particular the new highway to Kukës has opened up access to northeast Albania, and the chapter dealing with that part of the country has been reorganised and expanded. The author also mentions the addition of information aimed at the increasing number of visitors who arrive in their own cars or mobile homes. Another new feature is a selection of suggested itineraries for visits to Albania ranging from a few days to a month. Articles about Albania in the travel pages of mainstream newspapers are rare, and articles about the country's remote northern mountains even rarer. So it's good to see a piece in today's Observer about a journey to the Valbona Valley in the Albanian Alps. The article focuses on the scenic two-hour ferry journey on Lake Koman: "Just as you conclude you're heading straight into the side of a mountain, the water opens up again and you turn into a narrow passageway between two vertical walls of rock". The account of the practicalities of Albania travel are likely to strike a chord with many visitors to the country. Although finding solid information about the ferry trip initially proved difficult, "... eventually a taxi driver with a few words of English called a friend and arranged for us to be picked up early the next morning. This was typical of our experience. Ask someone on the street and, even if they can't help, they'll find someone whose second cousin definitely can". At the end of the piece the Observer bravely commits itself to an actual timetable and departure point for the connecting buses that link the city of Shkodër to the ferry. This morning the Hungarian airline Malév announced that it is to cease operations immediately. This development will leave some large gaps in the air transport map of Southeast Europe, at least in the short term. Malév's flights linked all the Balkan capital cities, and some smaller places as well, to Budapest and onwards to the global Oneworld network. On a personal note I am sorry to see Malév's Dublin-Budapest link disappear as I used it a number of times at the start or end of trips to the Balkans - on one occasion taking a connecting flight from Budapest on a tiny aircraft to the equally tiny airport at Targu Mures in Romania. The news comes just a few days after the bankruptcy of Spanair. The collapse of the Barcelona-based airline is of much less relevance to the Balkans, but it does mean the loss of a route from Barcelona to Belgrade and of summer services to Croatia.